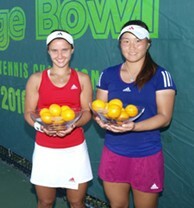 Lauren Davis defeated Grace Min to win the Girls' 18s singles title. George Morgan is the first British singles champion in the 64-year history of the Dunlop Orange Bowl. KEY BISCAYNE, Fla. – All the makings of a memorable upset were present during the Dunlop Orange Bowl Girls’ 18s final on Sunday. The underdog – unseeded Grace Min – aggressively saved two match points in a second-set tiebreak. The favorite – No. 8 Lauren Davis – appeared exhausted as her 18th match in 21 days extended into a third set. But then Davis did what she’s done in all but one match since the US Open. She walked away a winner. After three hours and 15 minutes, Davis (Gates Mills, Ohio) captured her third ITF Junior Circuit title in as many weeks with a 6-3, 6-7(7), 6-1 victory over Min (Duluth, Ga.). "I’m so tired," said Davis. "These last three weeks went by pretty fast because I was enjoying myself, winning. Now I get to take a two day break before another tournament (laughs)." The 5-foot-2 Davis entered the final having won 24 straight sets, spanning title runs at the Yucatan World Cup and Eddie Herr Championships. She carried that confidence into her match with Min by taking a 3-0, two-break lead – hitting her groundstrokes deep down both sidelines. Min managed to recover one break by becoming more aggressive, and she held two break points to even the first set at 4-4. Davis attacked the net to save both, drawing a Min backhand error before putting away a swinging forehand volley. After four deuces, Davis held for 5-3 by approaching the net again, retreating to the baseline when Min hit a lob, and then forcing Min into a backhand error. Min missed another backhand to give Davis the first set – the match beginning to resemble Davis’ 6-2, 6-4 win over Min eight days ago in Bradenton, Fla. But Min would not go down as easily again. She celebrated loudly after crushing a cross-court forehand winner past Davis to take a 3-2 second-set lead. "I just played her at Eddie Herr so I was feeling a little more comfortable with her game style," said Min. "In the second, I found another gear and I kept hanging in there. I didn’t want to give up." Though Min consolidated the break for 4-2, Davis evened the set two games later when she did what she does best: taking a high, short ball on the rise with a cross-court forehand approach before punching a volley out of Min’s reach. Serving at 4-5, Min was two points from defeat when Davis stepped into a down-the-line backhand. But the 5-foot-4 Min made good use of her strong thighs by bashing a cross-court forehand winner from the far corner of the court. Min held serve twice to force a tiebreak, which saw the server win the first 10 points. The baseline judge called Min for a foot fault at 5-5, and though she made her second serve, Min framed a forehand to afford Davis a match point. With the title on the line, Min dared to hit a drop shot, drawing Davis into the net before passing her with a down-the-line forehand. "I pushed her deep and I had the opportunity there so I went for it, even though I was match point down," said Min. "It ended up working in my favor." Davis earned another match point by turning defense into offense and forcing Min into a forehand error. She had the win on her racquet after Min approached the net, but just missed the sideline on a forehand pass. After Min held to take an 8-7 lead, the players exchanged 26 shots before Davis mishit a forehand. "I just tried to stay focused," Min said of the tiebreaker, "and not lose my mind." Despite what had just transpired, Davis’ will to win increased as the match entered a third set. "I was discouraged because I had match points," said Davis. "But I calmed myself down. I think I wanted to win more than I was tired." Min’s momentum faded fast when Davis broke for 2-1. The No. 8 seed held for 3-1 following three return errors from Min, and then raced to 4-1 after Min hit a backhand drop shot that landed short of the net. Min managed to earn three break points in the sixth game, but could not convert. She let loose one final forehand long on Davis’ third match point. "The wind picked up a lot," said Min. "I didn’t notice it until it was too late, but I wasn’t moving my feet enough with the amount of wind." Since the US Open, Davis has won 33 of 34 matches and five titles: three on the ITF Junior Circuit and two on USTA Pro Circuit. She will take a 24-match winning streak with her this week to Atlanta, where she will compete for an Australian Open wild card. "I feel prepared, especially going into the tournament with all this confidence," said Davis. "I’m going to take tomorrow off, and then I’ll be fine again." In the Boys’ 18s final, No. 9 seed George Morgan became the first British player – boy or girl – to win a Dunlop Orange Bowl singles title. He defeated No. 12 Jannick Lupescu of the Netherlands, 6-2, 6-3. Morgan has made a name for himself in South Florida at this time of the year, having won the 2007 Junior Orange Bowl Boys’ 14s event. He broke Lupescu’s serve three times in the first set, clinching a one-set lead when the Dutchman missed a down-the-line backhand wide. "I didn’t play my best," said Lupescu. "There was a lot of wind and we had to wait long for the girls’ final. I was a little bit nervous – more than normal – and I think he saw that in my game plan." Lupescu’s backhand broke down early and often in the second set, and Morgan was well aware of it. The Brit broke for 3-1 by following a cross-court forehand approach with a cross-court backhand volley, which forced Lupescu into netting a backhand. "Usually his backhand is his stronger shot," said Morgan. "I kept playing heavy to his backhand and he didn’t really like it. It’s quite windy and he was struggling to deal with it." Morgan showed great feel to hold for 4-1: winning the first point of the game with a squash-shot forehand and the second behind a backhand slice approach that landed on the baseline. From 30-love, Lupescu made two straight unforced errors with his backhand. After Lupescu misfired on – what else – a backhand, Morgan held a match point on his serve with a 5-1 lead. But at the very last possible moment, Lupescu’s level rose. He won 10 of 13 points to reach 3-5, 15-40 on Morgan’s serve. "I was nervous at the end, when I was trying to close the match out," admitted Morgan. "I was almost lucky to take that in the end. My serve helped me out." On the first break point, Lupescu chipped and charged, but could not get his racquet on Morgan’s precise down-the-line backhand pass. At 30-40, the 17-year-old Englishman dialed up the play that worked all day for him: hammering an inside-out forehand to break down Lupescu’s backhand. Morgan hit an ace on his second match point to clinch his first ITF Junior Circuit Grade A championship, and his first title of any kind since May of 2009. "I’m going to ring my mum when I get back and she’ll be over the moon," said Morgan. "Hopefully, I’ll get spoiled for Christmas because I won this tournament, so I’m looking forward to going back." Morgan’s countryman Liam Broady failed in his attempt to win a Dunlop Orange Bowl title. Belgians Julien Cagnina and Jeroen Vanneste defeated Broady and Nik Razborsek of Slovenia, 7-6(6), 4-6, [10-5], to win the Boys’ 18s doubles title. The first-time pairing of Lauren Herring (Greenville, N.C.) and Madison Keys (Boca Raton, Fla.) won the Girls’ 18s doubles title, beating Margarita Gasparyan of Russia and Ganna Poznikhirenko of the Ukraine, 6-4, 0-6, [10-8]. Herring won the title for her team by poaching for a volley – the ball ricocheting off her frame for a winner. "She had to go for that shank-poach winner," said Keys. "No matter how far the ball was going out, she just had to go for it."